JEGS Engine Lifting Chain 34"
The ideal way to lift/guide a bare engine block or partially assembled engine is this heat-treated 34" chain with a lifting capacity of 600 pounds. 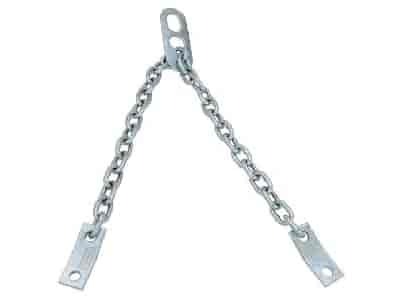 Commonly referred to as a "Sling", the chain has convenient bolt mounting tabs and a slip-free link-locking bracket that can be adjusted to balance or offset the load. 80049 is rated 4.5 out of 5 by 4. Rated 5 out of 5 by Ron42 from Great product I just installed my long block that I purchased in my truck with no issues I couldn't be any more satisfied with the product great buy for the price. Rated 5 out of 5 by jonesr08 from Great Price Good quality and great price help me with saving money on my engine rebuild. Rated 3 out of 5 by Bob from Brute Speed from I wish it was longer This lifting chain would work much better if it had around four more links in the chain. It is probably the perfect length for lifting a SBC from the intake manifold bolts, but if you are lifting an LS engine from the ends of the heads, it is pretty tight. What diameter bolt will fit this device? This will take a 5/8&quot; diameter bolt.